First dram of the night had a nose of butter, grapefruit, milk chocolate, sugared raisins, spiced apple, vanilla cream and a hint of minty chocolate. To taste it had more milk chocolate, cocoa, sugar syrup, pepper, stewed apple, toffee, olive oil and some cinnamon heat. It finished with lingering raisins, cocoa and a touch more cinnamon spiciness. 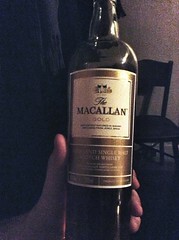 As usual we tasted blind and when the bottle was revealed it was the new Macallan Gold. A controversial dram, the no-age statement replacement for a variety of Macallan’s younger whiskies, both the sherry oak and bourbon cask matured fine oak. 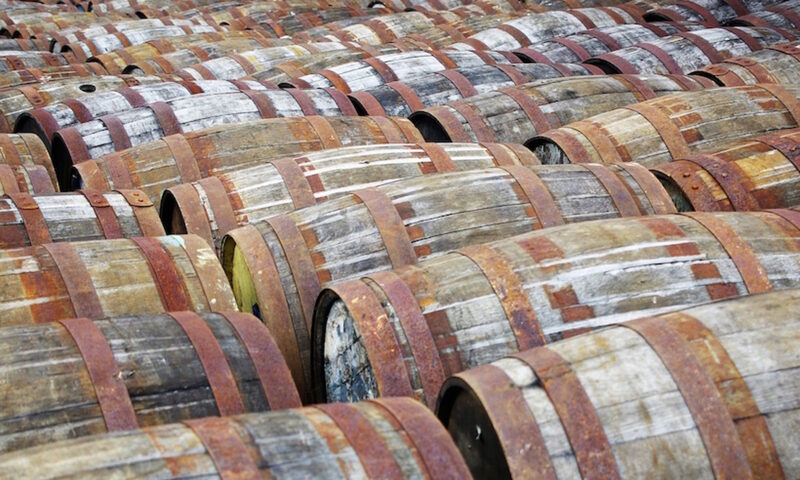 After years of criticism that Macallan were straying from their sherry cask matured core competency they have now binned everything that isn’t sherry and the range that the Gold belongs to, although it is still the only entry in the line-up at the time of writing, is all about sherry casks again. It’s not got an age statement (nor will any of the others in the range), but I’ve heard that it’s about 9-11 years old, and is named for the colour of the spirit – Gold is pretty accurate. I’d tried a sample of this in the past and disliked it, finding it young and spirity but this production bottling has much more to it and seems to fit nicely at the bottom of Macallan’s range. One I need to explore again. The next dram was similarly coloured to the first, with a nose of fruit leather, leathery leather, woody spice, cocoa, lemon zest, light polished wood, and hints of menthol and waxed fruit. On the palate the menthol from the nose hit first, followed by more woody spice, rich caramel, wood polish, runny honey and white toast. It finished with beeswax, apple skin and clean, fresh oak, the label came off to show that it was a Gordon & Macphail bottling of Imperial 1994, bottled in 2012. The Imperial distillery is now properly closed after a number of years of mothballing, with owner Chivas now looking into levelling the site and building a new super-distillery in its place. Although, after recent announcements of their earnings have been interpreted both favourably and less well who knows if their capacity expansion projects will continue. 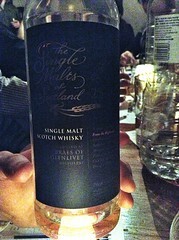 Whisky #3 had a nose like a Christmas nut bowl, with hazelnut and almond shells joined by a little nutty sweetness. It continued with damp washing, chocolate cake, graphite orange peel, raisins and a touch of hot spice. To taste it started spicy, adding in sour fruit, real apples, apple chews, cinnamon, dark wood, damp leaves and Fox’s Glacier Mints. It finished with butter, spice and pepper. 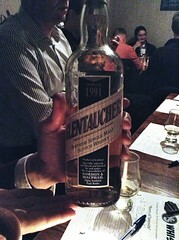 The paper came off to reveal that it was another bottling from G&M, this time a Glentauchers 1991, bottled in 2009. Glentauchers very rarely hits the the single malt market, almost entirely going into blends, but there are a few indie releases, including this ongoing ‘standard’ bottling. G&M are fortunate in that over the 100+ years that their shop has been open they’ve managed to acquire whisky from most of the distilleries that have run in Scotland over that time, currently covering about 80 of them I learned recently. 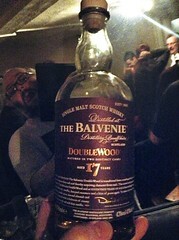 Whisky #4 had a nose that was herby and minty, with grass and pine but quite closed. To taste it was quite intense, with the mint from the nose joined by gravel and salted caramel, as well as a kick of alcoholic heat. Water calmed things down and revealed some crunchy sour fruit – apples and unripe mango – and it finished with some fruity dark chocolate. After two distilleries that few people had tried there was a reluctance to have a guess, and the bottle was revealed to be a Single Malts of Scotland Braes of Glenlivet 1989 to mainly blank stares, bottled last year at 23 years old. It’s a particularly young distillery, having only popped up in 1973 (and been closed between 2002 and 2008), and has been part of the Chivas portfolio for its entire life, with its whisky going in to their various blends, most notably Chivas Regal. These days more often referred to as Braeval, thanks to The Glenlivet’s unstandably rabid protection of their name, despite them both being part of the Pernod Ricard family (leading by example, methinks), it has no official releases of its own, relying on indies to get their whisky into the world other than hidden in blends. I’ve only tried a few and there’s been little in the way of common notes so far – one to investigate more thoroughly. Especially if I can get some of the BBR one I tried earlier this year. 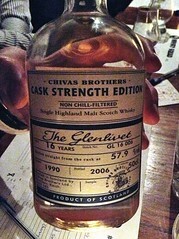 Whisky #5 was another cask strength dram and had an unreduced nose of pine, peppery spice and stony minerality. To taste it was quite punchy, with sweet caramel, blowtorched bananas, cinder toffee, green herbs and a touch of menthol. Water brought out a bit more minerality on the nose, and fruit and honey on the palate, as well as calming down the alcohol. It finished with mint, spicy wood and a touch of cinnamon heat, even after dilution. Lable off this was shown to be a The Glenlivet 1990, bottled in 2006 at 16 years old. It’s part of a range of single cask releases from Chivas, covering most of their distilleries, which are mainly available at the distilleries themselves, with this one having been grabbed by Mr Standing at The Glenlivet a few years back. 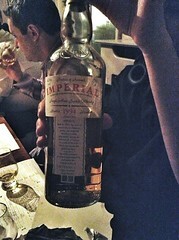 The penultimate dram had a nose of spiced red wine, sweet grapefruit and old, much handled copper pennies. In the mouth it had rich caramel, green leaves, a touch of struck match sulphur, soft sugar syrup and a metallic tang. It finished with liquorice, rich earth and grassy olive oil. Quite different to the other drams, with an obvious sherry influence, this was revealed to be Dailuaine 16yo from the Flora and Fauna range. Another whisky that is seldom seen as a single malt, although they have a following through indie bottlings and this F&F bottling (constantly rumoured to be discontinued, but as yet extant), being a backbone of the ‘meaty’ whisky components of Diageo’s blends. They’re well known for their hefty medium sherried drams, exemplified by this 16yo, but I’ve also had a few lighter bourbon cask matured whiskies showing that there’s a few more strings to their bow than is often thought. 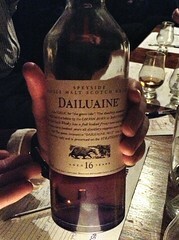 The last whisky of the night had a soft and spicy nose with honey, vanilla, milk chocolate and Crunchie bars. On the palate it had apple chews, apple skin, rich caramel (Cadbury’s Caramel bars, specifically) and nutmeg. It finished fruitily, with dark chocolate and cherries. It had a distinctively shaped bottle and the label came off to show that this was indeed from the distillery that we thought, although not necessarily the expression we thought – the new Balvenie DoubleWood 17yo. We wrote about this at work when it appeared and I thought it quite pleansant – maybe not as more heavily aged than the 12 year old as I expected after a further 5 years in the cask, but definitely a step up from that already tasty staple. Speyside Single Malt Scotch Whisky, 40%. ~£35. Speyside Single Malt Scotch Whisky, 43%. ~£45. Speyside Single Malt Scotch Whisky, 43%. ~£40. Speyside Single Malt Scotch Whisky, 54.9%. ~£75. Speyside Single Malt Scotch Whisky, 59.7%. Sold Out. Speyside Single Malt Scotch Whisky, 43%. ~£70.